3SI helps our clients and partners achieve positive program outcomes. We strive to make a material difference in the work of our clients and the lives of the people they serve. We are based in Seattle, Washington. Art Credit: © 2013 Anderson Design Group, Inc. • www.ArtAndSoulOfAmerica.com • Seattle skyline art used by permission. 3SI works with the state of Washington to implement the $165 million Race to the Top Early Learning Project. A major goal is for 54 percent of the state’s licensed early child care facilities to achieve demonstrable improvements in early learning. This will positively affect approximately 90,000 children. Art Credit: Gustav Klimt, "Mother and Child," c.1905. 3SI works with the Bill and Melinda Gates Foundation’s Agricultural Development Initiative on multiple projects. Examples include mapping opportunities for rural and urban poverty reduction in sub-Saharan Africa and targeting productivity improvements across staple crops, high-value crops, and livestock. Art Credit: Twice25 and Rinina25. 3SI Consulting = insight. intelligence. impact. 3SI helps clients convert data into information and knowledge to make a positive social impact. We specialize in delivering business intelligence and program evaluation services to public sector organizations, philanthropies, and not-for-profits. The availability of information continues to evolve at an exponential pace, making it difficult for public sector organizations, philanthropies, and not-for-profits to keep up. 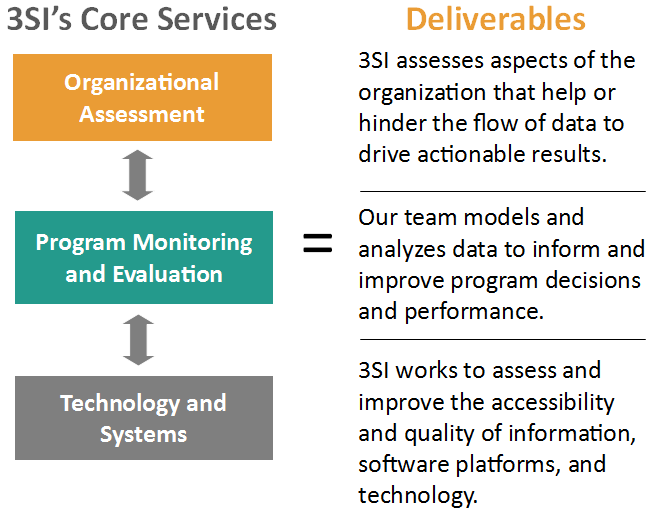 3SI helps our clients navigate this dynamic environment and use data to expand and enhance program impact.